I have two go-to hair looks - straight & curled. Then from there it's either having a good hair day and staying down or it's not co-operating and it's going straight up into a bun/ponytail. 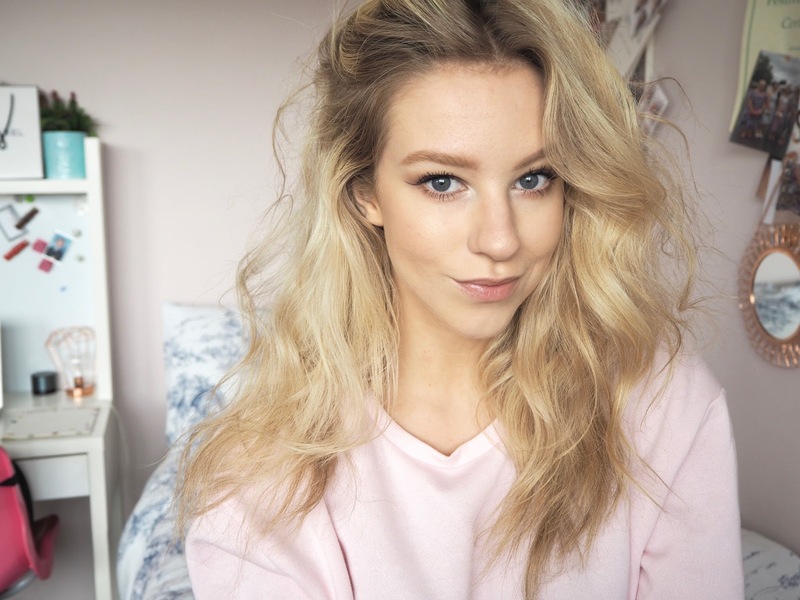 Here's a little background to my hair type - it's thick, curly, frizzy and dry, so all in all a complete pleasure to style.. not. Oh and I have a seriously sensitive scalp that cannot handle product build up. I start by washing it, using Herbal Essences Coconut Shampoo and Conditioner, I have been using this combination for years! I love the smell and my hair always feels super soft afterwards. Before I dry it I spritz on the OGX Coconut Water, this adds hydration and smells bloody beautiful! I then blow dry my hair as straight as possible, which of course is impossible but hey I try. Then if it's the night before I want to style, I run the straighteners over it to take away the frizz and fluffiness. 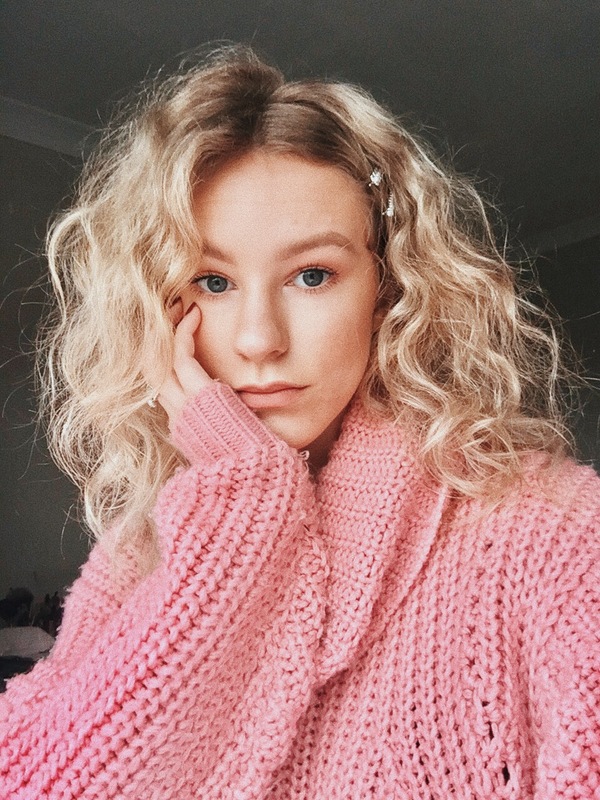 If it's the morning I roughly do that then go straight in with my Tresemme curlers (these aren't my exact ones but they're similar) on the hottest setting, it's the only way my curls will hold. When curling I have two different routes. For a more messy look I alternate the way I curl each section so one towards the face and one away. For a more sleek defined look I do it all one way - away from the face. Charles Worthington Volume&Bounce Texturising Spray, honestly this stuff smells amazing and does such an incredible shop of adding that lived in look without weighing the hair down. 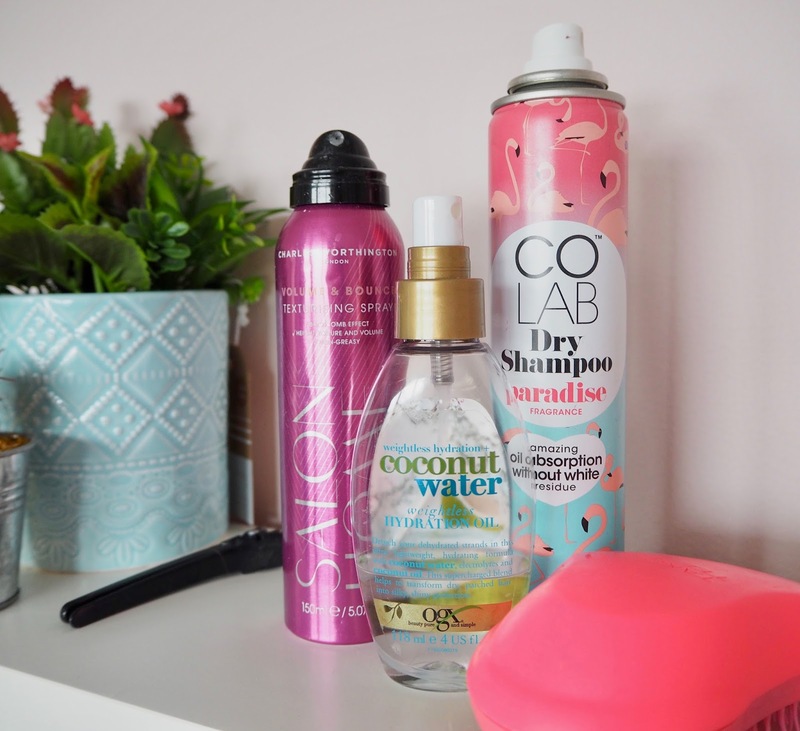 To refresh the look the next day I run the curlers over any sections that have obviously dropped and then spritz in some of the COLAB Dry Shampoo - I love the Paradise fragrance, it smells like summer in a bottle. For a treatment I sometimes coat my hair in coconut oil over night if I can be bothered, I definitely should do this more often but I'm seriously lazy when it comes to my hair. If there's also a lot of product build up or I have a bit of time to spare before I shower then I use the Lush Superbalm.